This is a shed that is just impossible not to be impressed by, Crane put a vast amount of research into looking at and studying old, English style sheds from all around, East Anglia and that is where the inspiration for this shed comes from. This is just a very nice, high quality and decent sized shed and let’s first of all talk about the big feature of this shed that your eyes are always drawn to and that is the lovely, log store located on one side of the shed. The first time you see this shed your mind will race with just all the things you could store inside here. Along with that brilliant log store, you will notice that classic, English corrugated roof. Corrugated roofs are not really the “in” thing in regards to shed design these days so it is very nice to see one here. A nice door, strong glass (and that is real glass by the way!) window and that classic vertical sawn board cladding all give this shed a very striking and impressive first appearance. 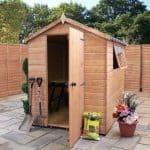 We are sure that everyone who comes into your garden will be asking you questions about this shed each time they see it! That log store is really cool! 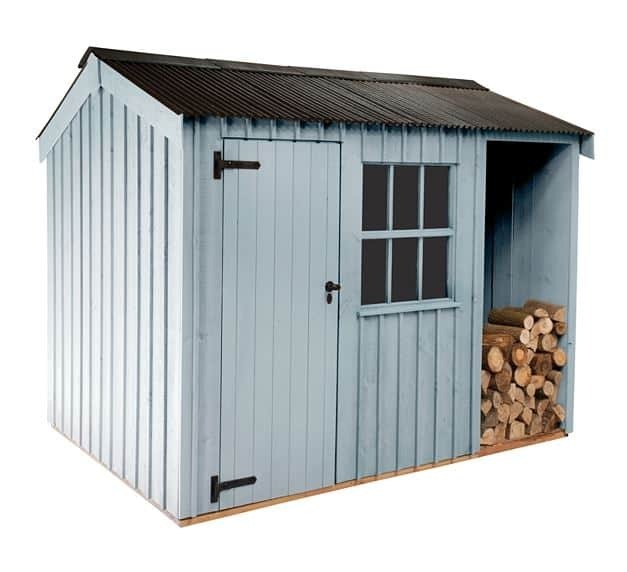 This is not a cheap shed! 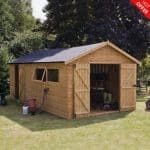 So we spent a lot of time in the lab, worked out our calculations and we really put this shed through its spaces and now we are going to take a closer and more in depth look and see if this shed and its unique log store are just what your garden needs. 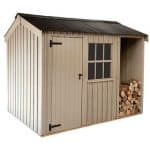 Now when you look at the dimensions on paper, you see that this is a shed that does offer a nice amount of storage space and that is something we really love. Crane have done just such a great job in maximizing the space that is available here. At 6 feet 3 inches high there is more than enough room to get around in there. The log store on the side of the shed is a 2 feet 9 inches wide and 5 feet 9 inches high (same as the door) and it adds a considerable amount of extra storage space for you to use. Now clearly the idea of this is to store your wood (it is called a log store after all) but really you can store whatever you want in here and adding this extra bit of space is very nice and also practical, but we do wish they had an option to put another door on here as you will not want to put anything in here, you do not want getting wet. The Roof of the Crane National Trust, Blickling Shed is really nice and just very British. Of course your eyes are drawn to that nice and strong, corrugated roof sheeting that is used here. Now this will keep the rain at bay……. And look fantastic in the process, but also holding this up is some 19 x 125 mm tongue and groove roof boarding which is the standard roof boarding Crane use on most of their sheds and it is very strong . Crane have made sure that the roof not only will stand up against our horrible British weather, but they have made sure the roof will look very nice doing it. As far as the framing goes Crane are using some very sturdy 38 x 50 mm planed framing that is made from the same Scandinavian Redwood the cladding is. This means that you get a very “uniform” and structured type of look for the shed, but also it is going to be strong like a bull throughout the whole shed. We have seen more than a few “pretty” looking sheds let down by weak framing and thankfully that is not the case here we are happy to say. Crane like many other shed manufacturers use the same kind of boarding for the floor that they do for the roof. This is 19 x 125 mm tongue and groove boarding and it is held up with some very strong, 38 x 50 mm floor joists that are expertly spread out to make sure your floor will be strong for many, many years. Unless you are keeping your solid steel safe with millions of pounds inside here then this floor is going to be able to take whatever you have! You get a pretty standard warranty when you are dealing with Crane. 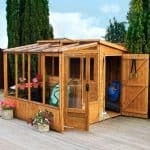 It will last for two years and they will come to where you have the shed and make any repairs or replacements that may need doing. Now their warranty will only be valid for what they class as general wear and tear and not accidental damage or abuse! 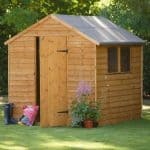 If you are insistent on them building the shed in an area they warn you is not “ideal” then this will also void your warranty. T hese Crane, National Trust sheds really hit it for six with the doors. The Dimensions of the door are a very impressive, 710 x 1800 mm which means getting things in and out should not cause you any major problems. 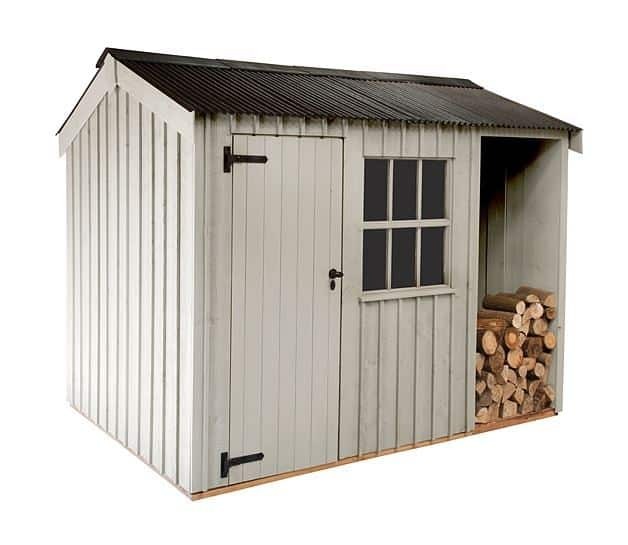 The black hinges and door handle really stand out and just add to the overall high quality look of the shed. It may sound silly for us to be so excited over door hinges, but we have seen far too many sheds over the years have the doors start to get issues because of cheap hinges…. You sure as heck will not have that problem here this door is built to last! 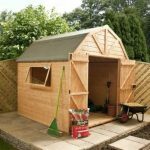 The front of this shed has a lot going on and for some this may seem a little bit too busy, but we love it! You have the door and the log store on each side, but in-between you have this lovely Georgian style window that is made from 4 mm thick glass. So it not only looks very nice in the middle, but it also is strong to take the odd hit from the kids football! Those hinges we were gushing about just up above are joined with a mortice lock that comes with a key. So once you are done with your gardening for the day or just pottering around inside, you can keep things locked up nice and secure. Now the window may be able to let people see what is inside your shed, but some kind of nice, classy curtain can fix that and add to the look of the shed. 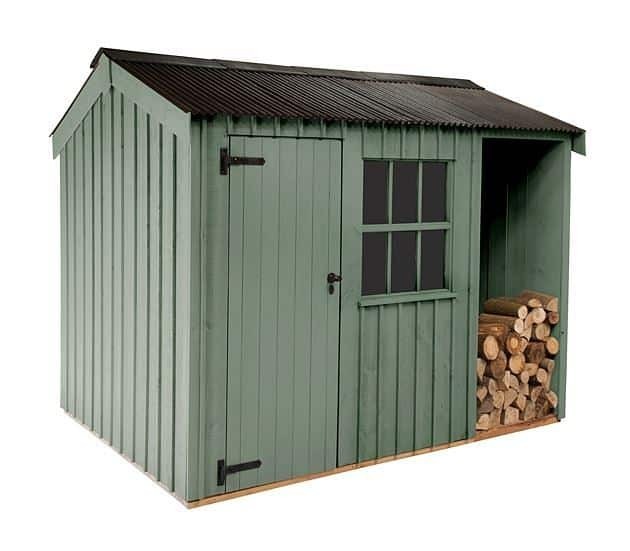 Crane offer six different coats of paint for this shed they offer a pretty good selection of colours in Dome Ochre, Wades Lantern, Painters Green, Earls Grey, Terrace Green and Disraeli Green. There is a colour to fit every garden. Crane really do not mess around and this shed is just so classically English that you cannot help, but love the look of it. But as well as being very easy on the eyes, you also have one very strong shed on your hands here. Now Crane do use the best Scandinavian Redwood and that corrugated roof will keep things inside dry. But as nice as that log store looks if you do not keep things in it and leave it just open then it is going to get filled with water and snow in the harsh winter months so this could cause problems down the line. We have no issues with the storage at all! You have a good amount of space inside, but when you take the log store into consideration, you have just a ton of storage space on your hands here. One of the bonuses of getting a Crane shed is that they will do all the hard and sweaty work for you! Delivery and installation is included so just sit back with a beer and let them get to it. Look at over two grand this is not a cheap shed at all, but at the same time it is made from very strong wood, has a great design and would certainly be a stand out feature in any garden……… but if you want a shed purely just for storage space and are not too concerned about what it looks like then this may be a bit much. Final Thoughts: We do love the first impression that the Crane National Trust Blickling Shed gives. The door, window and that log store make this such a unique and nice looking shed that we really do think it is one of the nicest looking sheds in this line. 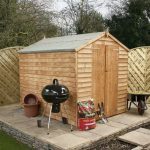 For a person looking to buy a shed that is just as much a feature in their garden as it is for storage……. And money is not an issue, you will be very happy with this shed.